Marcus Livius Drusus was Tribunis Plebis in 91 BC when he revived the cause of the Gracchi brothers and proposed to extent citizenship to the Socii - the Italian cities allied to Rome. He was promptly assassinated - and his death sparked the devestating war known as the Social War, which lasted until 88 BC. From the ashes of that war emerged two strongmen - Sulla and Marius - who each fought to shape the future of the Republic. After defeating Marius, Sulla revived the office of Dictator and enacted a series of constitutional reforms returning power to the Senate at the cost of the Tribunes. He then dismissed his Dictatorship, returned power to the Consuls, and was elected consul on regular terms in 80 BC, after which he retired. He died the following year. Obverse: Laureate head of Apollo right, trident behind, control mark A below chin. Reverse: Warrior riding horse right, holding palm frond and reins, above a trident right. L PISO FRUGI and control mark R in two lines below. Obverse: Laureate head of Apollo right, club (control mark) in left field. Reverse: Victory advancing right, holding wreath and palm-branch, L PI - SO across fields, FRVGI in exergue. Obverse: Laureate head of Apollo right. Reverse: Marsyas standing left, raising hand and holding wineskin over shoulder; L•CENSOR downwards in left field; column surmounted by statue of Minerva(?) in right field. Obverse: Turreted head of Cybele right; behind, to left AED•CVR downwards; foot pointing upwards. Reverse: Curule chair inscribed P•FOVRIVS; CRASSIPES in exergue. Obverse: Diademed head of Pietas ; stork in right field. Reverse: Elephant walking left; Q•C•M•P•I in exergue. Obverse: Bust of Diana right, draped, with bow and quiver over shoulder. S•C blow chin. 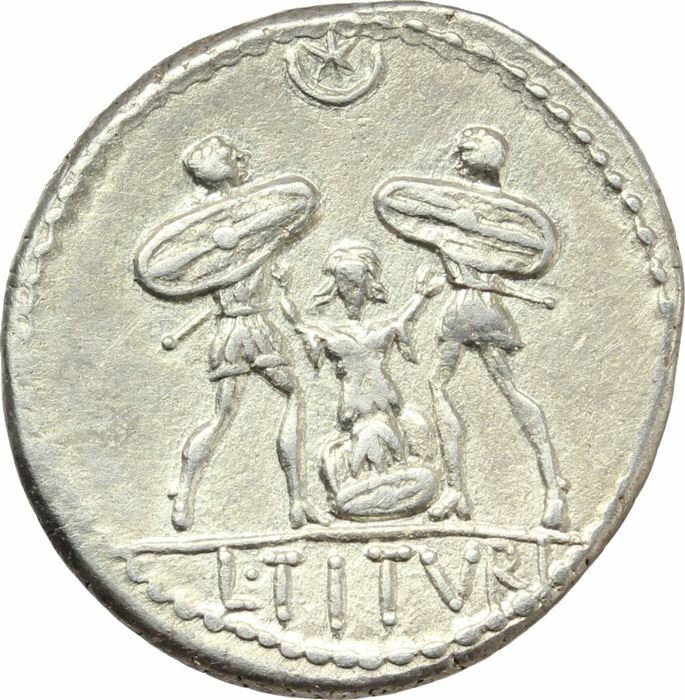 Reverse: Victory in biga riding right, holding palm-branch, reins and wreath, IIII (control mark) below. TI•CLAVD•TI•F AP•N in exergue.